On Friday 26th June 1970 shortly after 10pm, in the somewhat incongruous setting of St. Pancras Town Hall's fading Victorian splendour, Mississippi bluesman Eddie “Son” House took the stage for the first date of an intensive four week tour of Britain. He had been before, with the 1967 American Folk Blues Festival, but this occasion was more momentous as the headlines in the Melody Maker tried to impress on its readership: “Your last chance to see the Son”. There had been a certain loss of dexterity since his 1967 tour, perhaps to be expected in a man of nearly 70, but what his fingers lacked in precise picking was more than compensated for by his spine chilling voice and eerie slide playing. House's opening concert performance was greeted with standing ovations; which was to be the case wherever he played during those four weeks. The appearance of Son House in Britain that year was almost certainly the last time most would get to see an artist so important and so influential in the history of the blues. More to the point, for many, he was a bluesman from whom could be drawn a direct line - House-Robert Johnson-Muddy Waters-Elmore James and so on. Paul Oliver, writing in the Melody Maker at the time, reinforced this: “For the blues enthusiasts the living witness to the Mississippi tradition, he is virtually set apart from normal critical appraisal. Playing partner to Charlie Patton and Willie Brown, inspiration of Robert Johnson and Muddy Waters, he is a key figure in the story of Delta blues with a timeless reputation”. Twenty years on, it is perhaps a salutary reminder that not so many years previously, save for the cognoscenti, very few would have heard of Son House or the handful of recordings made for Paramount in the 1930s or the two dozen titles recorded by Alan Lomax in the 1940s. Yet in 1970, at the age of 68, he was here playing nation-wide, sell-out concerts and even recording a BBC Radio One session which the Radio Times promoted as by “the father of the Delta blues”! This disc presents concert performances recorded during that tour at two sessions at the 100 Club in London's Oxford Street. One on June 30th, in company with longtime fan and Canned Heat member Al Wilson, the other on July 14th with British admirer “Delta” Dave Kelly sitting in for one number. As such these recordings serve as a nostalgic reminder of the elation all blues fans felt on seeing Son House in person. In the words of one fan: “This blues session on July 14th was one of the last before his retirement but he's still full of life, a fact that was emphasised in the club setting, far better suited to the blues than is any concert hall. Son was very relaxed, in a good mood and chatted freely to the audience, cracking jokes for all the world as if he was singing in his own living room. Son House is a great artist and echoes of his past glories are present in every performance”. Never more so than on the astounding fifteen minute tour-de-force, ‘How To Treat A Man'. Those attending will well recall that performance, it had the entire audience silenced and rooted to the spot. The club bar must have had its quietest quarter of an hour in history! House leaning over his highly polished National guitar, his face creased and eyes shut in concentration drew verses from songs of forty years previous, his voice sonorous, occasionally cracking into falsetto, while his fingers flayed the strings and the copper slide traversed the fret board in response to his vocal. If the young Dave Kelly was in anyway overawed to the same extent as the audience it never shows and produces from him a most sympathetic accompaniment. Which is also what Son receives from Al Wilson's harmonica playing on ‘Between Midnight and Day' and ‘I Want To Go Home on the Morning Train'. Wilson, well known for his role in Canned Heat, was also a blues collector, devotee and one of those responsible for encouraging House to come out of retirement in 1964. His harmonica backing to ‘l Want To Go Home' is a quiet masterpiece of subtle taste, the notes cascading slowly around House's guitar and vocal, creating the impression of growing intensity and involvement. 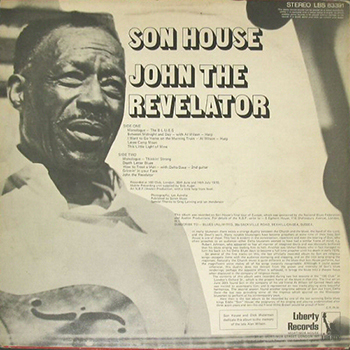 Son House was a committed Baptist and despite his ambivalence towards the Church (‘I'm gonna get me a religion, I gonna join the Baptist church, be a Baptist preacher so l won't have to work', he sang in 1930) House was a practising part-time preacher. So, not unnaturally, several of the numbers performed are of the acapella religious variety for which he encourages the audience to join in by stomping, clapping and, on ‘John The Revelator', singing the responses in true Baptist fashion. The juxtaposing of these unaccompanied religious items and the blues tends to bring his reworking of songs like ‘Levee Camp Moan' and ‘Death Letter Blues' into sharper focus during a concert performance. For those who attended on the night and familiar with the original versions of those numbers, it was all but impossible to obtain any detachment. The emotional impact, admittedly probably nostalgic, was too overwhelming. As one critic put it: “He did one song which was magnificent by any standards, his famous ‘Death Letter Blues', with superb compelling guitar, very moving. I'm glad I was there”. Re-living those performances through this recording that emotional impact still exists even if the sense of occasion has perhaps got lost in the mists of time! 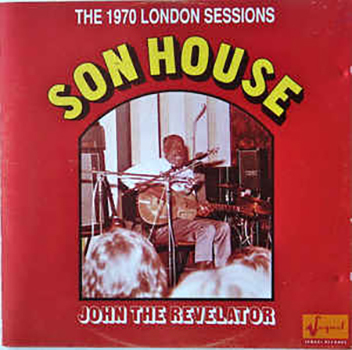 Son's appearance at the 100 Club that July evening marked the last in a tour that had taken him from the English south coast to Scotland, from Swindon to Cambridge and he even took two days out from that punishing schedule to fly to Switzerland to appear at the Montreux festival. Not bad for a man in his late sixties who, reportedly, was retiring due to failing health! Returning to the States, Son House went into semi-retirement occasionally surfacing to make guest appearances at festivals but by 1976 he had entirely given up music. He and his wife Evie, whom he'd married in Mississippi in 1934, moved to Detroit, Michigan. There they remained until his death on 19 October 1988, aged 86. He was survived by his wife, two daughters and a son. AB postscript December 1993: The BBC Radio 1 session was recorded 6th July at the Playhouse Theatre, London (producer John Walters) and was broadcast on John Peel's Top Gear show July 11 1970. Mike Raven's R&B show rebroadcast it on 9th August. There was a bit of chat introducing each number - My Good Gal, Death Letter and Don't You Mind People Grinning In Your Face.